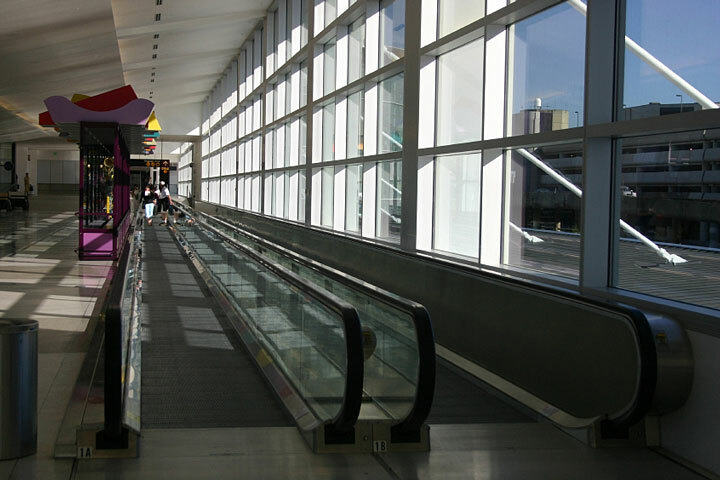 Washington's busiest airport is the Seattle/Tacoma International Airport. Other major Washington airports include the Bellingham International Airport, the Boeing Field/King County International Airport in Seattle, the Friday Harbor Airport, the Pangborn Memorial Airport in Wenatchee, the Pullman-Moscow Regional Airport in Pullman, the Roberts Field in Redmond, the Spokane International Airport, the Tri-Cities Airport in Pasco, the Walla Walla Regional Airport, the William R. Fairchild International Airport in Port Angeles, and the Yakima Air Terminal/Mcallister Field. The photo at right shows a moving walkway at SeaTac International Airport. This Washington airport map shows FAA-designated commercial service airports, reliever airports, and general aviation airports in the State of Washington. Primary airports are designated with an airplane symbol. Washington airport map source: FAA 2001-2005 NPIAS.